Tencel lyocell blends fabric has good moisture absorption and permeability with the peach velvet appearance. Linen fiber is a kind of "green fiber" with the natural health care function, which absorbs moisture with good air flowing, bacteriostatic, anti-mildew, anti-ultraviolet, non-static and other natural functions. The linen fabric is distributed with unique linen sections. The blended Tencel and linen fibers have water and perspiration absorption, heavy silk touch feeling and drape soft waxy wearability. In the meanwhile, this blended cloth surface is evenly distributed with peach peel appearance.Tencel Linen blended fabric is a typical example of combining recycled fiber and natural textile materials. Both have improved their functions and uses. When the warp Tencel and weft linen are interwoven with each other, the former has good toughness and strength with a certain degree of tension. 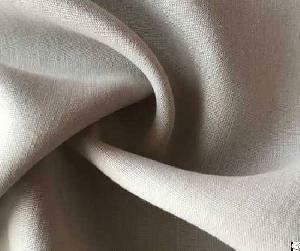 However, linen is more rigid and has strong corrosion resistance. Its irregular yarn evenness, for particular, creates a natural leisure effect. The Tencel linen blended tencel viscose linen blends fabrics is mixed with a certain proportion of Tencel and linen fabrics. The blending ratios, such as 70/30 and 60/40, are commonly seen. It is not as smooth as the Tencel or not as rough and rigid as pure linen yarn. It has a certain cotton-like feeling and its wearing comfort is also guaranteed.